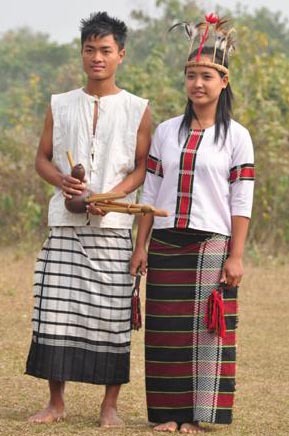 Lushai is another tribe under Kuki-chin group of tribes. Their main concentration is under Kanchanpur Sub-Division of North Tripura District. Lushai’s are commonly known as Mizos. Racially they are known to be under Mongoliod origin. In Tripura they are 5,384 persons (as per 2011 Census). Their culture is akin to the Mizos. Lushais mostly reside in Jampui Hills area of Tripura. Lushai live on Jhum Cultivation and hunting of wild animal. They eat meat of any kind of animals and birds. They are also famous as orange producing community. At some point of time Lushais were known as Head Hunter community. During 1st part of 19th century most of the Lushai’s converted to Christianity and still follow Christianity as their religion. Their Cheraw Dance (Bamboo Dance) is very much popular in and outside the country. Literacy rate among them comparatively is higher then that of other minor tribes of Tripura . A large number among them could be found in Govt. jobs and other economic fields.